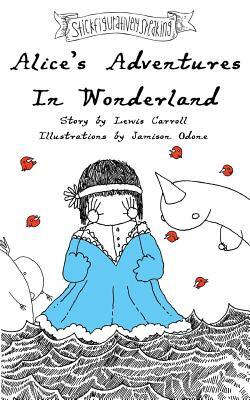 Lewis Carroll's classic tale of Alice's Adventures In Wonderland This is a reissue of the version illustrated by Jamison Odone which was released first under the series, Stickfiguratively Speaking in 2010. This 150th anniversary edition is Lewis Carroll's tale of Alice, completely illustrated in Stick Figures. Publishers Weekly had this to say about Odone's rendition of Carrol's story, "Odone's retelling of Alice's Adventures in Wonderland reinvents the world...with all the whimsy and wonder of a child chasing a mysterious white rabbit. Mixing text with stick figure illustrations, Odone's lighthearted take on the characters is refreshing; it allows the story to breathe and see itself in a new and magical way.